Every summer, groups of Southern Nazarene University students travel together to Nazarene church camps throughout our district. These students are the members of SNU Crew, and they organize fun activities and games for the campers as well as help them learn more about SNU. Applications are currently open for SNU Crew for this summer. 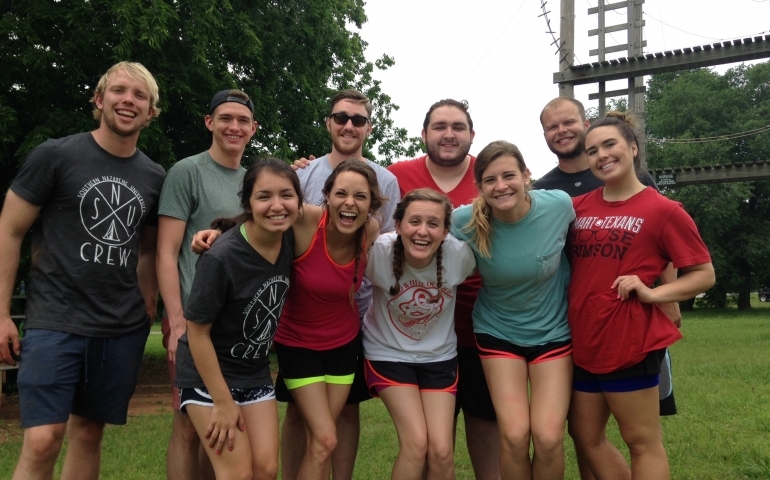 Last summer, a total of nine students participated in SNU Crew. They were split into two separate groups. One group went for the entire summer, while the other only did half. Jewelia Long and Mady Martin are two students who participated in SNU Crew this past summer. Both of them recommend it to others and reflect fondly on their experiences. Both Long and Martin applied for SNU Crew because of their previous experience at camps. Long had worked at camps in the past and enjoyed it, while Martin remembers SNU Crew having played a large part in why she chose to attend SNU. “All we really did was work with the students and the campers, and so I feel like I made some good friends with the middle school students and high school students while I was there,” Long said. “I really feel like I had an impact.” She also commented that she is still in touch with some of the students she met at the camps. Martin also believes she had an impact on others as a part of SNU Crew, but the experience also had an impact on her. “I grew close to my SNU crew and also to campers that ended up becoming students here at SNU,” Martin said. Long feels she grew in her faith because of her experience and the opportunities she had to see God move in the camps. “I went to some camps where I saw the Lord really work in some kids’ lives. One night we were worshipping. and we just kept worshipping for like an hour after because it was one of those experiences where you just didn’t want it to end,” Long said. Martin and Long highly recommend fellow students seize the opportunity to participate in SNU Crew as well. “It is a great experience and you meet so many great people. The best part is that you will grow in your faith and also grow in your leadership abilities. It is a once in a lifetime opportunity to spend a summer on the road with great people. Don’t pass it up,” Martin said. This past summer was also special for SNU Crew because they were able to participate in Nazarene Youth Conference (NYC), an event for Nazarene high schoolers that occurs every four years. NYC took place this time in Louisville, Kentucky. The SNU Crews attended it along with the SNU Admissions Staff. “NYC was the best part just because you got to see so many different high school students from literally all over the country. I met people from Hawaii, Washington [and] Canada. I got to meet all those people and be a representative from SNU. I felt like I had purpose, and I felt really a part of something bigger than just myself,” Long said. “My favorite part was NYC … The party was the coolest experience of my summer. Contrary to popular belief, Nazarenes can dance,” Martin said. If you’re looking for something to do this summer, SNU crew is a fun, impactful option you should consider. Applications are available at the Admissions Office, and the final deadline is Mar. 9.